Have you ever felt like there is way too many baby stuff nowadays? You stroll in the mall, and you see activity stations, bouncers and pretty much anything in between. However, not everything you see is compatible to your child. 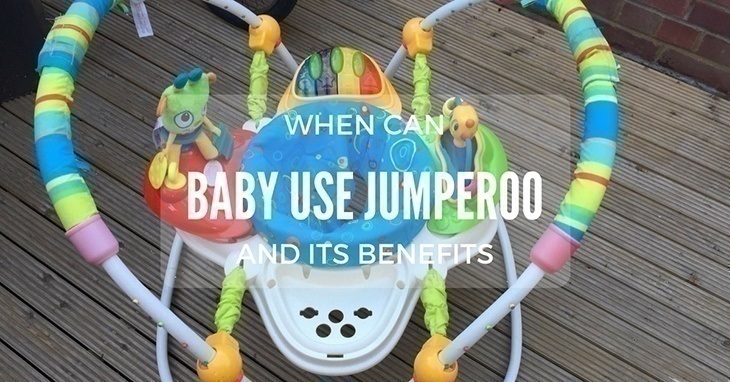 You may ask, when can baby use Jumperoo? Let’s face it; it’s probably one of the most popular gears today. I know because all my mom friends have it! Toys aren’t just playthings. Depending on your child’s age, it should be more than just fun – it should be educational too. If given at the right time, it could enhance some of their skills and even nurture their physical, mental and psychological development. 1. Fun Physical Activity: When they’re inside the Jumperoo, they will get plenty of chance for leg movement, and since there are various objects they can grasp and reach out for, it’s a valuable and fun activity for them. It can be an ‘exercise’ because they have to move their entire body. It’s an important element for them to reach some of their milestones and while I wanted him to ‘work out’, it wasn’t possible for us to go to the funhouse every single day. It's a good alternative to all those baby gyms. 2. Mental Stimulation: When they grab at stuff, it helps develop their hand and eye coordination. The different shapes and sizes can stimulate their visual senses, and they’re able to appreciate the colors. Also, because there are some Jumperoos with music, it can enhance their auditory senses too. Overall, it’s not just strengthening their physical faculties but more importantly, mental and psychological. 3. Muscle Development: When you put them on the jumper, they will appreciate how they can move their legs and of course, jump. It’s a good way of developing and building up the leg muscles. However, I need to crush the myth that using a Jumperoo can help them learn how to walk. It’s a fallacy. The muscles usually involved in this type of activity are those found in the legs and neck (when they’re sitting upright). It’s the thigh and back muscles which are mostly responsible for walking. 4. Allows More Mobility For The Parents: It’s perhaps the most obvious perk of using this gear. When I bought it, I found the freedom to do simple household chores like cooking, washing dishes, tidying up, or even doing a quick “me” time like reading or watching my favorite shows. It goes without saying that even though you tuck them in safely in the jumper, they still need close supervision so you should at least be in the same room. But I don’t have to carry him around, and I have the peace of mind that he won't be crawling to some unsafe place each time I look away for a few seconds. To sum it up, it’s been a great lifesaver thus far. 5. Absolute Enjoyment: Learning doesn’t have to be boring. There’s a spinning seat which allows them more freedom to move. You won't have to worry you're confining them to one perspective only. And this is portable, by the way. So you can bring it during travels. Your little one can start anywhere between three to four months. Just make sure by the time you put them in the Jumperoo, they already have good head control to stop it from lolling to one side. Also as much as possible, they should be able to sit up with little to no assistance. Remember, no matter how much fun you want them to have, safety should always be the priority. Don’t push it if they're not yet ready. They won’t enjoy it if they can barely physically support themselves. Keep in mind; it should be appropriate for their age. Using the jumper way too early might do more harm than good – the same thing goes for other baby toys. But don’t worry if they start out even at five months because some kids enjoy using Jumperoo up to nine months old! So you see, it will be worth it. If your bundle of joy has met the necessary prerequisites (age and physical milestone), then there’s no question about using Jumperoo. Just make sure you observe all the safety precautions such as staying close at all times and not leaving them alone to go to a different room even for a few seconds. Share your experience with the Jumperoo in the comments! Right now, you should also visit this article about other milestone in the development of children as: when do babies start dancing﻿?